I've just learned that Steve McCormick one our long-suffering graduate students passed away late last week due to health problems. Steve was a graduate student when I first arrived at CSULB. He completed his course work and was slowly attending to his MA thesis. He began working for Cogstone, a local CRM firm on a fulltime basis and like many students, the reality of a real paycheck and actually doing archaeology on a professional basis moved his interests away from his degree. As a student, he asked lots of questions and had tremendous enthusiasm for the discipline and its practice. Steve was an extremely friendly and genuinely nice person and was well liked by the faculty and the rest of the students. He spread the reputation of our MA program among contract firms and help get a number of our students jobs at Cogstone. I can definitely say he will be missed. This is very sad news. 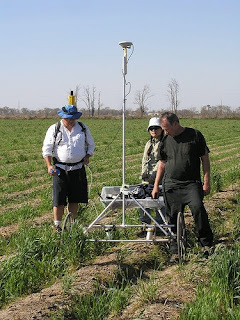 Steve McCormick (left) with Dan Larson and Sachiko Sakai in the field (SE Missouri) using the magentometer and GPS. 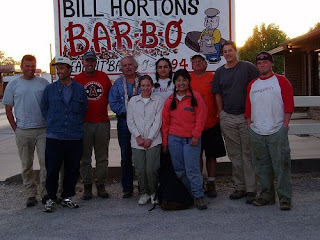 Steve McCormick (just below the pig and in the red shirt) with students from CSULB, RC. Dunnell, Dan Larson and MIke Cannon.